BROSSARD, Que. -- Montreal Canadiens owner Geoff Molson got his man. After an exhaustive search for a new general manager that had Molson and adviser Serge Savard scouring the hockey world for candidates during the past few weeks, the Canadiens hired a man who worked his way from being a journeyman defenseman to becoming an astute scout to finally building a solid reputation in the Chicago Blackhawks front office. Marc Bergevin, 46, was introduced Wednesday morning as the Canadiens' 17th general manager, leaving his post as GM Stan Bowman's assistant in Chicago to take what is arguably one of the most prestigious front office positions in all of sports. Bergevin, who received a five-year contract, says his 20 years as a player in the League taught him to value one quality above all, and that is the importance of a team concept. "While it is never easy to lose someone of Marc Bergevin's caliber, both professionally and personally, it is a tremendous opportunity for him and his family. He has played a significant role in our success over the last several years as a member of the front office and coaching staff, and his roots in Chicago stretch to 1983 when he was drafted by the Blackhawks. I want to personally thank him for his dedication to our organization and certainly wish him all the best in Montreal." "If a player doesn't put the team first, he will have trouble under me," Bergevin, a Montreal native, said following an introductory news conference that ran for nearly an hour at the Canadiens' practice facility. "You can ask anyone I played with, I was always a guy who tried to bring people together. If there was a guy who played five minutes a night, I tried to make sure he was a part of it, because that's what I believe in." The hiring marks a big moment for Molson as the lead owner and president of the Canadiens, something he says completes the process of putting his own stamp on the team. Molson says the original list of candidates he and Savard compiled had approximately 20 names on it, and that three men reached the final stages of the process. While Molson did not mention any names, it's been widely reported the two other candidates were Tampa Bay Lightning assistant GM Julien BriseBois – who previously held the same position in Montreal – and NBC Sports analyst and Montreal native Pierre McGuire. Both of those men would have been better known to Canadiens fans, but Bergevin won over Molson and Savard over the course of three interviews, with the final one taking place over six hours Monday at the team's practice facility in suburban Brossard. Even Molson admits he didn't know too much about Bergevin when the process began. "At first it wasn't obvious, there were a lot of strong candidates with different profiles, and when Marc's name was brought up I knew very little about him," Molson said. "During one of our phone conversations, I even did a search on Google to make sure I knew what he looked like." Molson said Bergevin's history as a player shone through in the way he spoke about his management philosophy and how to build a team. "The fact that he lived in dressing rooms for 20 years…I think he benefited greatly from that. The way he talks about players is pretty deep, and it is with a lot of respect," Molson said. "Marc represented the kind of guy I want heading our hockey organization." Bergevin described himself as a "people person" and he had a reputation as a great prankster during his playing days. He showed off his sense of humor Wednesday when he was asked what was going through his mind when he found himself still being interviewed by Molson and Savard six hours after their discussions began on Monday. "I was wondering why they didn't bring any food," he quipped. On a more serious note, Bergevin tried to avoid getting into too many specifics about what he will be doing to fix a Canadiens team that finished last in the Eastern Conference and 28th overall. But he did say he believes some pieces are already in place to turn things around relatively quickly, mentioning impending restricted free-agent goaltender Carey Price and defenseman P.K. Subban as key building blocks. "This team has a good nucleus," Bergevin said. "Obviously when you finish 15th in the conference there's a lot of work to be done, but the foundation is there." Bergevin, however, did directly address a few of the burning questions facing the club. First and foremost, Bergevin said his first phone call Wednesday morning was to interim coach Randy Cunneyworth, a former teammate with the Hartford Whalers, to inform him he was being downgraded to the position of assistant coach. Bergevin said it will be up to the incoming coach to decide whether he wants to keep Cunneyworth on his staff. As for his choice of coach, Bergevin refused to put any deadline on the hiring -- and aside from affirming that the new man in charge will be bilingual, he would not delve into the specifics of who that will be, or even what type of coach he is looking for. "The way I was brought in was very confidential and I want it to be the same way with the selection of my coach," he said. "It will be low key." Bergevin did say he is open to hiring a coach with no NHL experience, which widens the list of bilingual candidates that would be available. In terms of the Canadiens hockey operations staff already in place, Bergevin said current assistant GM Larry Carriere is welcome to be part of the new staff going forward, though not necessarily with the same title. But amateur scouting director Trevor Timmins was given a definitive endorsement from his new boss. "I will make that clear right now, he will be at the draft table with me," Bergevin said. "I've never worked with Trevor, but he will be sitting next to me in Pittsburgh." It was an important point to make because the Canadiens hold the third pick in the NHL Draft in June, and Bergevin spoke just as definitively about how Montreal will approach this draft and future ones going forward in terms of finding homegrown players that have slipped through the team's fingers over the past number of years. "The players in the Quebec Major Junior Hockey League, they are playing in our backyard and I want to build a staff that will make sure we don't miss out on any players from Quebec," he said. "Right now we have one scout (in Quebec). We'll have more than one from now on." Bergevin replaces Pierre Gauthier, who was relieved of his duties on March 29 after a two-year run that culminated in Montreal finishing with a 31-35-16 record and missing the playoffs for the first time since 2007. One area in which Gauthier was criticized was his dealings with the media -- and, by extension, the public. Molson cited Bergevin's qualities as a communicator as one of the principal factors in his hiring, and Bergevin himself said he is perfectly comfortable tackling the public aspect of his new job. "This is who I am, what you see is what you get," Bergevin said. "I'm here, I'm not going anywhere." On the hockey side, Bergevin is held in high regard as a talent evaluator, with legendary coach Scotty Bowman once saying that he "has got a really good eye" for spotting hockey talent. Rick Dudley, the Toronto Maple Leafs director of player personnel and a former colleague of Bergevin's in the Blackhawks front office, told a Montreal radio station last month that he considers Bergevin to be among "the top 1 percent" in terms of talent evaluators in the NHL. "Rick was being too nice," Bergevin said with a smile. After being taken by Chicago with the 59th pick in the 1983 NHL Draft, Bergevin played 1,191 games on defense over 20 seasons with the Blackhawks, Islanders, Whalers, Lightning, Red Wings, Blues, Penguins and Canucks. 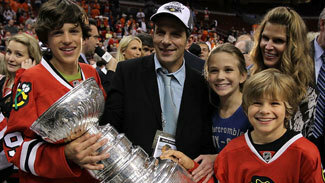 He joined the Blackhawks scouting staff in 2005 and was named director of pro scouting in 2007 before becoming the team's director of player personnel, and finally being named assistant GM after Kevin Cheveldayoff vacated that position to become GM of the Winnipeg Jets in the summer of 2011. Bergevin will be under some pressure to perform in Montreal, with a fan base upset over the difficulties of this past season and eager for a return to the gloried history of the franchise. But Bergevin said he is confident that he is prepared for the challenge and he strongly affirmed his belief that he did not simply get the job because he is a born-and-bred Montreal native who speaks French. "I'm not entitled to be here just because I'm from here, I believe I'm ready. Yes, I'm French-Canadian, but I believe I could have been a candidate for any of the 30 teams in the League," Bergevin said. "I woke up this morning and told myself I'm the general manager of the Montreal Canadiens. It's a big task, but I'm not scared. ..When you believe you're able to do the job, you don't feel any pressure."